The theme for week 3 of the MeMeTales Readathon is Character Development. I thought long and hard about what we might do to talk about different elements of our character, manners and positive behavior, and was having a hard time coming up with something other than reading more books about positive behavior (which we did in fact do). Sweet P and I read Good Habits to Have and talked about different ways we could be kind to others. She's still learning about honesty so we read Hermie and Wormie in the Flood of Lies (Max Lucado's Hermie & Friends) to discuss the importance of telling the truth. We also read A Life God Rewards for Little Ones (Breakthrough Series) , The Berenstain Bears Forget Their Manners , Please Is a Good Word to Say by Barbara Joosse and Pat Them Gently (a $1 book from Target). After the kids went to bed that night I got out my materials for my personal bible study. I'm in the midst of doing a personal bible study at our church where we learn 6 different bible study methods. This week's method is the Word Study method by Rick Warren and pretty in-depth. You begin the method by choosing a word to study in the bible. There were several examples and a list of word choices, but I decided I'd work within the theme of the week and chose the word Character. After finding the meaning, you go hunting for where the word appears in the bible. I was a bit surprised to see that it only occurs 3-4 times (depending on your translation). Not only so, but we[c] also glory in our sufferings,because we know that suffering produces perseverance; 4 perseverance, character; and character, hope. 5 And hope does not put us to shame, because God’s love has been poured out into our hearts through the Holy Spirit, who has been given to us. Through suffering we learn to persevere (keep trying), which builds character (moral competence), which leads to hope. And hope does not disappoint (different translation of Romans 5:5). I found other scripture passages that referred to character such as 1 Corinthians 15:33and Hebrews 13:5. But the verse that took me in another direction (where I'm going with this) was 2 Peter 1:5-7, which lists the characteristics of someone with good character. 5 For this very reason, make every effort to add to your faith goodness; and to goodness, knowledge;6 and to knowledge, self-control; and to self-control, perseverance; and to perseverance, godliness;7 and to godliness, mutual affection; and to mutual affection, love. We see love again, kindness, faithfulness, self-control, goodness and a few other characteristics to embody. From here I saw that LOVE appeared over and over (which should come as no surprise). And I also saw hope and faith. Can you see where I'm going? I said the verse "And now these three remain: faith, hope and love. 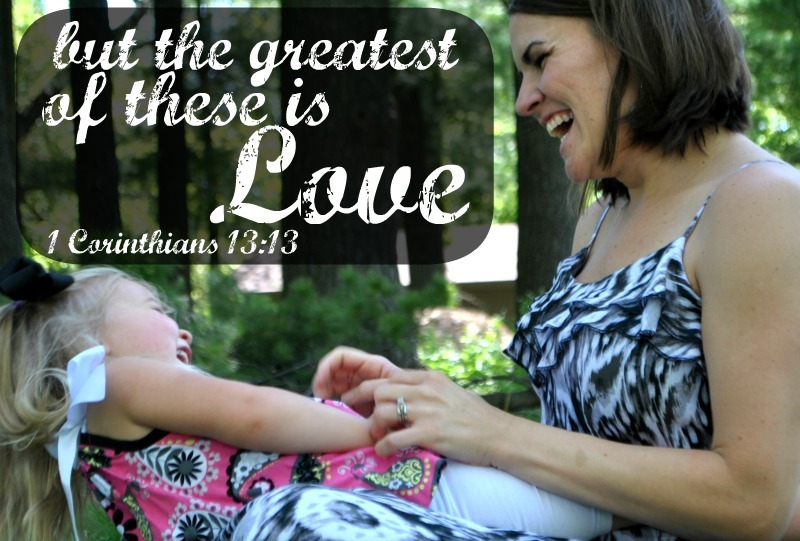 But the greatest of these is love." in my head and thought, "of course." 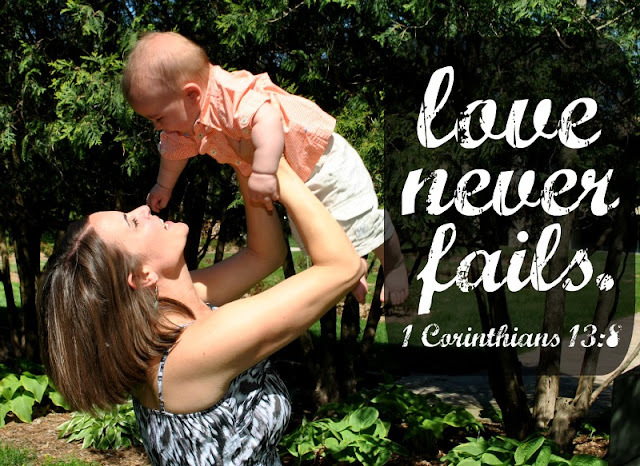 Then I turned to 1 Corinthians 13. And as I read the passage, one I've read more times than I can count, I suddenly realized that in teaching my children to love God and love others as He loves us, they inherently learn patience, kindness, humility, integrity, honesty, self-control, gentleness and perseverance. All of these character qualities are found in love and the perfect example of love comes from God's love for us. If we can strive to love and teach our children to love as God loves us, then all the other characteristics follow. The word LOVE appears in the bible over 7,000 times (NIV). Turns out that's what He's been teaching us all along.